I was originally going to save this until later on in the month since it's my favorite horror movie of all time but a discussion of this film in my Video Seminar prompted this viewing. One aspect of the movie that I really appreciated this time was Nicholson's performance. He does such a good job and his gradual insanity is a sight to behold. I know that it can come across as a bit much depending on the viewing, but I think he did exactly what he needed to: ooze insanity. And my god, those tracking shots. 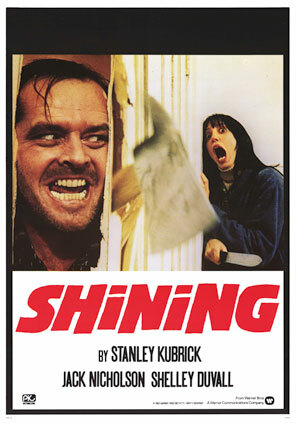 This is one of my favorite movies of all time for a reason and a large part of that is due to being at the hand of Stanley Kubrick. The tracking shot following Danny as he goes through the hotel on in his tricycle: pure magic. The sound design of that scene, coupled with the intense conclusion, makes for one of the greatest scenes in any movie, ever. Yes, it's that good.